FOXBOROUGH - For the first time this season, Everett failed to go into the half with a double-digit lead. 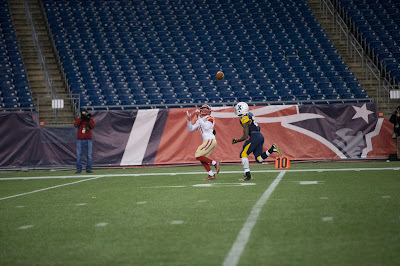 Early on in Saturday night's Division 1 state championship game at Gillette Stadium, Xaverian did a great job of running the ball, keeping Jake Willcox and the explosive Crimson Tide offense off the field for much of the first half. Everett received the ball to start the second half and, after a 19-yard Jake Willcox run, the junior quarterback faked a stretch run play and hit wide receiver Anthony Norcia on a slant and go, or "Sluggo," route. Norcia caught it in stride and scored a 29-yard touchdown, and the Tide never looked back. Norcia did a great job of getting Xaverian corner Ike Irabor to open his hips inside. Once he did, it created the separation Norcia needed, and he was able to stack him. A 14-10 halftime advantage eventually became a 35-10 final, sparked by Willcox and Norcia's connection.